My laptop is at home and it is not connecting after the migration. Option 1: Close Outlook, connect to the VPN, re-open Outlook. Option 2: Remove your account and recreate it. Online Archive is a feature for Office 365 enterprise customers who have uncommonly large mailboxes. These customers can use an Online Archive to avoid deleting old mail. 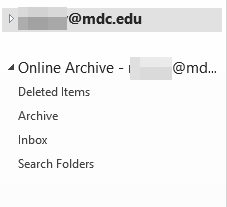 A user’s Online Archive acts somewhat like a second account in Outlook with its own folder structure. As a result, it is not included in searches performed from the Inbox. When Should I use my online archive? We recommend using the online archive feature to keep your Inbox clear of messages you have already answered or acted on. Think of the Archive like a file folder. You can store items in the Archive folder and still access them easily. From where can I access my Online Archive? 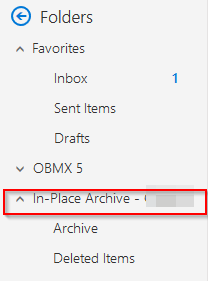 From Outlook Web Access (OWA) you can access your Online Archive in the folder list called “In-Place Archive – Username”. Online Archive cannot be access from your mobile device from either the native or Outlook apps. You must use your devices mobile browser to log onto OWA. How do I recover items I deleted? 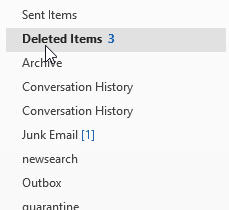 Items deleted from your inbox are first placed into your deleted Items folder. They will stay here until they are manually deleted. Select the “Deleted Items” folder in your folder list. Click on the “Recover Deleted Items from Server” button under the “Home” tab. After items are purged from the “Recover Deleted Items” folder, they are gone permanently and can no longer be recovered. IMPORTANT: There are no back-ups made to email in Office 365 so items that have been removed from your mailbox will not be able to be recovered.